One of the biggest complaints we hear is “why do all the new customers get all the good deals?” Well Dish Network hears it too and they are responding. Dish Network is currently running a promotion called Dish it Up. It is meant for existing customers who want to add extra tv’s or upgrade to newer receivers like the Hopper and Joey system. What kind of deal we can get for you depends on how long you have been with them and how timely you’ve paid your bill. In our experience, about 80% of customer will qualify for a free upgrade if they have been with Dish Network for at least a year. There are two catches, first you have to sign a new two-year agreement, and second it requires a credit or debit card to qualify. If you are in our service area, simply give us a call to run you through and see if you qualify at no cost. How does the HD Dual Tuner receiver work? You really can watch the game from the parking lot, in the backyard or anywhere you want with portable satellite television. Why go into the stadium when the view’s much better outside, the food and beer is cheaper and you can be as rowdy as you want! With football season in full swing, it’s time to get the Tailgater™ Portable Satellite TV Antenna that brings the game right to your tailgate party (or to your campsite, park, or any outdoors location). With the DISH Tailgater™, you can enjoy your favorite HD DISH programming anywhere outside you can see the southern sky. The Tailgater™ is just one of the many ways DISH innovates to let you watch TV when and where you want it. Whether you’re tailgating at your favorite sporting event, camping in the mountains or traveling the country in your RV, the DISH Tailgater™ allows you to watch all your favorite TV programming away from home. At just ten pounds, the Tailgater™ is the smallest portable satellite dish in on the market today and because it automatically finds satellite positions, you don’t have to adjust it manually. It easily connects to a DISH receiver and your television set allowing you to enjoy your favorite shows, movies and sporting events in HD while you’re away from home. In 2011, the Tailgater™ portable satellite television system was named an International Consumer Electronics Association Honoree for 2012 in Innovations in Design and. At the conference, products created by over 3,000 companies were judged by a panel of world-renowned industrial designers on criteria such as engineering qualities, aesthetic and design qualities, and unique features. This distinguished honor is yet another example of how the industry recognizes DISH’s commitment to providing the most technically advanced, convenient, and affordable satellite TV service in the business. The Tailgater helps prove DISH puts customer satisfaction on top of its list of priorities by constantly striving to make your TV-viewing experience both enjoyable and convenient. Simply set the tailgater on the ground, connect to your DISH receiver, which needs to be connected to a power source and to your TV and let the Tailgater do the work. It will find the satellite signal automatically and let you watch the same TV you watch at home when you connect your accounts*. With the Tailgater™, you can opt for a pay-as-you-go plan, requiring you to pay only for the months you use it. When you don’t need it, you simply stop your service with no penalty or cancellation fee. When you want to re-activate Tailgater service, you can do by contacting DISH by phone or log in to your account to reactivate your service. It’s that easy! With football season almost halfway through, order the DISH Tailgater™ now and start enjoying your favorite teams play in stunning HD while you tailgate. Why ever go into the stadium when DISH brings you the game, allowing you to stay closer to the chicken wings, nachos, and drinks! $99.95 plus tax for our current Wild Blue customers. 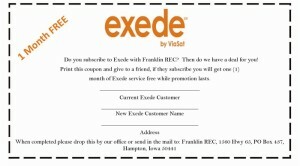 One-time fee for Wild Blue customers wanting to switch to any Exede 12 package. Two-year contract required. $149.95 plus tax for new customers. One-time installa-tion fee for new customers installing any Exede 12 package. Two-year contract required. $49.95 plus a $10 monthly fee for lease to own customers. One-time installation fee for new or existing customers installing any Exede 12 package. Two-year contract required. All packages have the same great speed. Each plan comes with a monthly data allowance which specifies how much data you may use every month. Exede 12-10 ($54.99 a month) Perfect for occasional video downloads, photo sharing, music streaming, social networking and email. 10 GB data allowance per month. 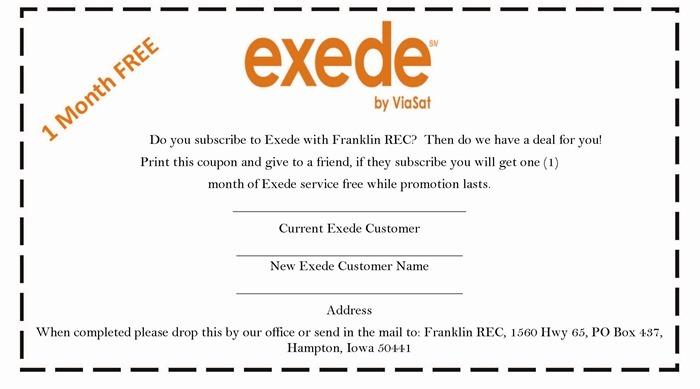 Exede 12-15 ($79.99 a month) great for those who spend more time on the Internet, use more data, and watch online videos more frequently. 15 GB data allowance per month. Exede 12-25 ($129.99 a month) this is the plan for those who depend on the Internet for work, entertainment, social networking, and more. 25 GB data allowance per month. Call Franklin County REC at (641) 456-2557 or (800) 750-3557 for more information. Start by pressing the “MENU” button on your remote. Select “Parental, Fav’s & Setup”. Enter a – (dash, lower most, left most key on your DirecTV remote). Make sure the DirecTV antenna you are using is listed in the three boxes on the left side of your screen. Tab over to and select “Dish Pointing”. Enter the Zip code of your current location. A block box will pop up with an azimuth and elevation for pointing your antenna. Write down or remember the azimuth and elevation. Here I select “Signal Strength”. It works best to have two people doing this and talking thru a window or over a cell phone. To find out which way out of alignment it is do a “push pull” test. Starting with the side to side adjustment, gently push the dish to the left and see if the signal goes up or down, then to right and see if the signal goes up or down. If it goes up by pushing to the left, then loosen the bolts on the back of the dish and turn it left just a bit and retighten. Perform the test again. When you are done the ideal is that pushing either to the right or left makes the signal strength go down, thats how you know you are aligned correctly. Perform this same procedure for the up and down elevation. Turn your TV on. Hold down the TV mode button on your DISH Network remote until all the other mode buttons light up. Let go of the TV Mode Button. It should be flashing. Once the TV goes off, press the “#” button. Place the remote back in SAT mode and it should now operate the TV power, volume, and mute. Sometimes you get a code that will only operate the power on the TV. Try the power scan again. It starts over where you left off. Sometimes there is a delay in the TV turning off. If you pass the code, you can go backwards using the same process, but with the “down channel” button instead. Go slower this time. Hey world, GreenBelt Satellites has upgraded the website to WordPress (yay). We hope this transition will help us on several fronts – marketing, communication and customer service. Check back to this blog for updates on all sorts of tips and tricks from the experts to get the most out of your dish and satellite services. Whether you need installation, service and repair, or consultation on upgrades and choices be sure to give us a call! We service Iowa Falls, Ackley, Eldora, Hampton and the entire surrounding area.